The metal's futures for September delivery traded as low as $2.6735 per pound, their lowest since July 14, 2017. “Demand still looked very good, [but] as the year unfolded, trade tensions started to weigh on growth,” says Suki Cooper, precious metals analyst at Standard Chartered. "Dr. Copper," as it is sometimes referred to by economists and finance experts, is often seen as a leading indicator of future economic trends since it is used in a number of different sectors. The metal's futures for September delivery traded as low as $2.6735 per pound, their lowest since July 14, 2017, when it hit $2.663. Copper traded at $2.691 at around 9:50 a.m., down more than 2 percent. "Dr. Copper," as it is sometimes referred to by economists and finance experts, is often seen as a leading indicator of future economic trends since it is used in a number of different sectors. Copper is used in home construction and consumer products, as well as manufacturing. Analysts at Citi, however, think that copper is setting up to be a buy for investors. "The ongoing major sell-off, driven by escalating trade frictions between the US and China, is setting up a longer term buying opportunity. 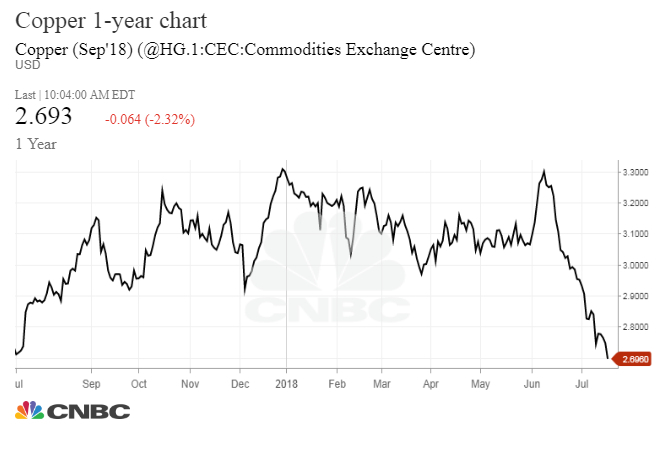 Here we look beyond the potential trade war to longer term copper market fundamentals and we find that current prices ... are nowhere near high enough to enable the market to clear," they said. — CNBC's Gina Francolla, Patti Domm and Jeff Cox contributed to this report.